Death is the great mystery. It is something we all will face, sooner or later. When or where, we probably don't really want to know - no matter how much we may enjoy trying to peak into the future about other matters. And what happens after life leaves our bodies no one alive really knows for certain, even if they claim they do. Death is big and scary and all too real. It steals away our loved ones, it feeds the tragic and terrible stories in the news, it lurks somewhere waiting for us and, unlike the bogeyman, it does exist. No wonder Death frightens us. And no wonder we need times like Halloween to make light of death; to realise we can enjoy being frightened by hearing and telling tales of horror. To wear the mantles of Death by dressing up as ghosts and skeletons and zombies and in that way to steal away a little of Death's power by taking on its guise and partying like there's no tomorrow. And, of course, for some there won't be - 1.8 people die every second. In this world there are three things that truly unite us - we are born, we live and we die. That is a trinity reflected in many faiths and cultures around the world. Those three facts of existence that define us are worth honouring, however we choose to do it. Many faiths and cultures also offer hope for what comes after Death but, as I have said before, no one has discovered any incontrovertible proof. Certainly there are those who claim to communicate with the spirits of the dead, and offer this as evidence. There are those who have had near-death experiences of travelling outside their bodies. There are those for whom faith is more important than evidence. There are those for whom the rational explanation can only be that life ends when the physical body can no longer support it. What I can say for certain is that, one day, we will each of us find out the truth about Death for ourselves. We will each of us face Death and, in that moment, life's greatest mystery will be a secret no longer. I also believe, having watched two people die - one my father, one a friend - that whatever Death's secret is, it brings peace. And what one does with one's life can help one face Death. I recently saw the movie Agora. Agora is a historical drama about a pagan philosopher called Hypatia who lived in Alexandria in 4th century AD Roman Egypt. You know from the outset that the movie isn't going to end happily. History tells us that the violent clashes between pagans, Jews and Christians lead to the sacking of the greatest library of antiquity and the death of many people, including Hypatia herself. Hypatia was a mathematician and philosopher and in the film she is studying the movement of the planets. She can see civilisation collapsing around her, knowledge being destroyed through ignorant vandalism and realises that she herself is likely to be killed by an angry mob because she is a pagan woman who refuses to give up her Independence and her studies. Yet what drives her on is her search to discover exactly how the Earth moves around the Sun. At one points she says that if she can work that out, she can go to her grave happy. I think we all have a dream, an ambition, a goal, our heart's desire; something that, if we achieve it, means we could go to our grave happy. Following that goal gives life meaning and purpose and takes away Death's power to scare us. 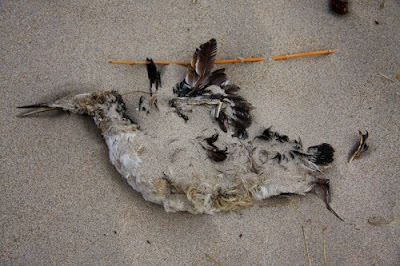 The picture above shows a dead seabird I saw on a beach. I didn't touch it, move it, or rearrange it. I just photographed it and left it for the sea to carry its corpse away.